Here you can find a strain description about Harlequin CBD and also some user-based reviews and infos directly from the SeedFinder (if available). 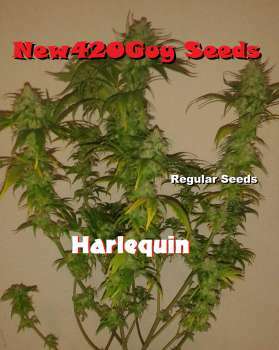 You can also find the offers and auctions here if Harlequin CBD cannabis seeds are on stock at MyCannapot right now. This is Paul's first high CBD strain, and it does well indoors and outdoors. It is a Sativa dominant hybrid and can get very tall when grown outdoors in the ground. The ancestry includes Harlequin, Strawberry Cough and Sour Skunk. Good for pain, loss of appetite, nausea, anxiety or depression. Flowering period is 8 to 9 weeks. Harlequin CBD is not available at our shop at the moment!